The Toyota Innova begins where the Maruti Suzuki Ertiga tops out. The most expensive version of the latter costs Rs 8.7 lakh ex-showroom in Delhi, while the Innova only begins at Rs 9.8 lakh. And for this money you get the same 2.5-litre four-cylinder diesel engine as on every other Innova variant mated to a 5-speed manual gearbox. You also get power steering, seating for eight people and identical interior room. However, there's no air conditioning, no electric adjust for the mirrors and no stereo. In fact, in the base E trim, the Innova offers very little for its price. More importantly this version doesn't even sport the revised look. There's nothing great about the looks of either the Ertiga or the Innova. But, the Innova given its longer length and a slightly longer wheelbase has a bit more presence. As far as interiors go, the Ertiga is easier to get in and out of given its lower ingress height. It has the more comfortable driving position too. Its seat height might be lower than the Innova's, but you still get a commanding view. Now as we explained earlier, we are comparing the top-of-the-line ZDi trim for the Maruti and the cheapest of the face-lifted versions for the Innova, the GX, singularly because this creates the least price differential. But, then the equipment list on the two cars doesn't read very different. The Ertiga gets dual airbags and ABS, while the Innova only gets one airbag meant for the driver along with ABS. 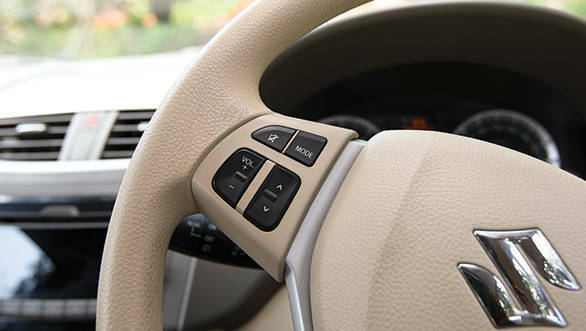 The Ertiga also gets keyless entry, power windows all round, electric adjust for the outside rear view mirrors, and rear defogger and wiper. The Innova, again, sports all these features in the GX trim and it also gets rear parking sensors. The Maruti might not have parking sensors, but it gets a stereo as standard which the Toyota lacks. When it comes to seating comfort, both vehicles get rear air con vents and bench seats that slide back and forth for the second row. These are finished in fabric on both vehicles and are equally comfortable. 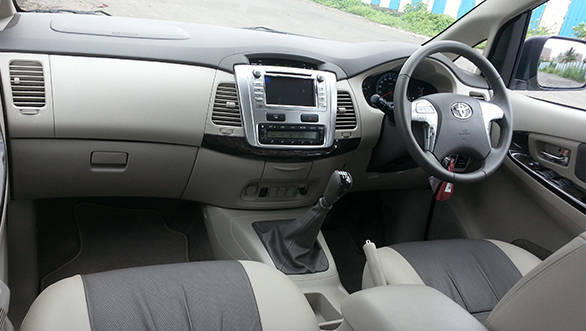 The Innova can also be ordered with captain seats for the second row; an option which isn't available on the Ertiga. 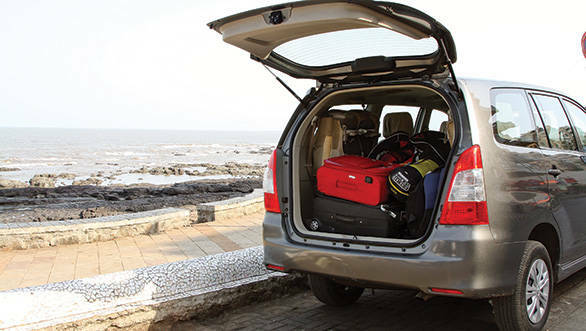 The Innova also scores more when it comes to space, both for the occupants as well as luggage. With all three rows occupied, one can still fit in a reasonably sized suitcase in the Innova's boot, while the Ertiga's boot can hold a bag at best. The Innova, thanks to its larger dimensions, has way more shoulder and head room, and the useable kneeroom considering both second and third row seating is better, and more comfortable too. 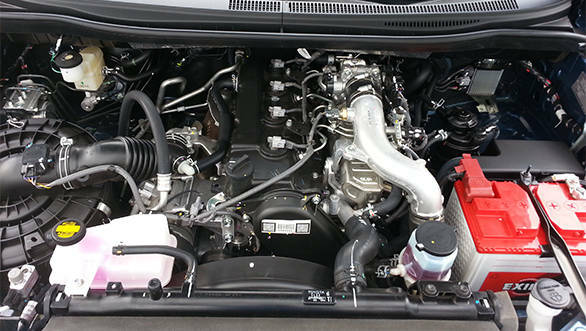 The Innova runs a bigger engine displacing 2494cc compared to 1248cc of the Ertiga. Both are turbocharged four-cylinder engines with four valves per cylinder. But the unit on the Maruti uses a variable geometry turbocharger. It's also a more modern engine. 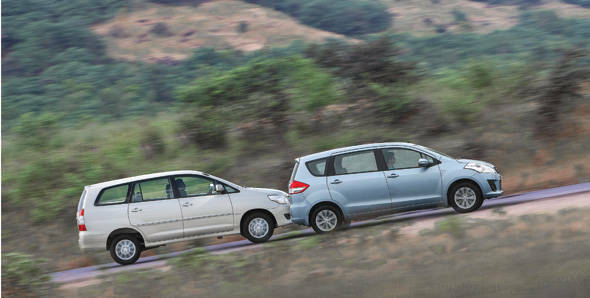 No surprise then, that the Ertiga manages to develop exactly the same peak torque as the Innova. Now, the Innova might develop a little over 10PS of extra power, but after factoring in the weight difference of the two MPVs, the resultant difference in power to weight explains why the Ertiga does better in the real world. The Ertiga has a little over 10PS/tonne advantage over the heavier Innova. In the real world, the Ertiga manages the 0-100kmph run in 13.3 seconds. The Innova requires over four seconds more to complete the same run. The Ertiga also manages a higher top speed touching 170kmph against 150kmph that the Innova can manage. 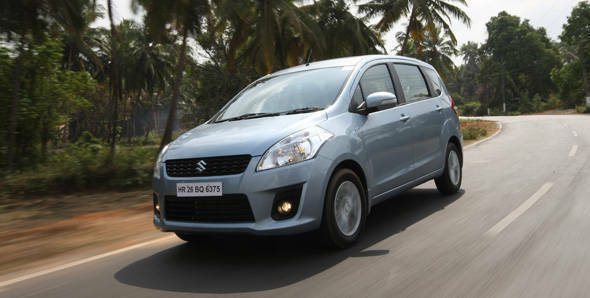 The Maruti is also quicker getting there. In the roll on tests, the Ertiga posts quicker times as well, making it more driveable in the city and an easier car to overtake with on the highway. But that's not all, the engine and weight combo also helps the Ertiga return better fuel economy figures both in the city and on the highway, and by a significant margin. A monocoque chassis construction does have its advantages, no doubt. The only area where the body-on-frame gives the Innova an upper hand is payload. But then again, the difference in carrying capacity of the two MPVs is barely 15kg; that's the weight of a six months old dog. The Ertiga's monocoque construction also helps it return more refined ride and handling that's closer to cars than an MPV. So, in the city over mild undulations and shallow potholes, the Ertiga's ride is quieter and more planted. And on a hilly road, it feels more eager to turn into corners and there's less inertia to deal with during quick direction changes, and that instills more confidence in the driver to drive the Ertiga quickly. It is also the easier car to drive in the city. The effort required to work both the steering as well as the clutch is lesser, and its smaller size and a tighter turning circle make it comparatively less cumbersome. Having said that, the Innova isn't exactly terrible. Yes, you do require more effort, and, yes, you will have to look longer for an appropriate parking space, but one can get used to it quite quickly. 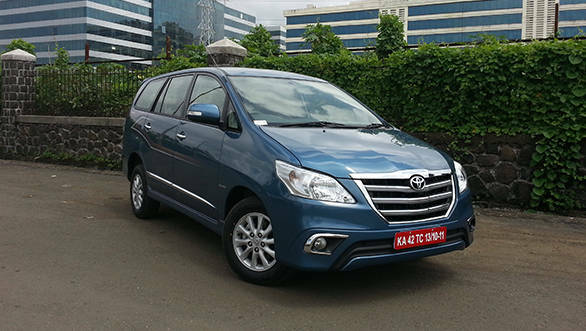 Moreover, given the Innova's weight and chassis construction, the Innova still rides and handles commendably. It does shake and jump more than the Maruti over broken surfaces at slower speeds, but as the speed rises, the Toyota does a much better job of ironing out undulations, pot holes and disguised speed breakers. It is clearly the better vehicle for intercity travel, or for outside city excursions, because it works even better when loaded. It also feels more stable in a straight line and even though it is heavier, it still takes lesser distance to come to stop compared to the Maruti. The Innova is also sturdier and stands up to abuse both from the road and the driver better, and that's a trait worth appreciating given the conditions four roads, especially as you move further away from metros. The Ertiga is cheaper, more fuel efficient and easier and quicker to drive. However, the Innova is better built, it can withstand more abuse, and it is the more spacious and flexible of the two MPVs. It's also better equipped, mechanically, to handle our highways. So, which one would we suggest? If the budgets permit, the Innova is still the better buy in our opinion.